Futsal is fast-paced, high energy indoor soccer with South American roots. With a smaller playing field and reduced team size (5v5), each player has more involvement in the game and touches on the ball. The game also uses a reduced bounce ball that ensures true roll and the need for a precise touch. Futsal ultimately sharpens technical and tactical skills needed for outdoor play, which allows continual growth and development throughout the year. The Futsal League of the Downers Grove Park District provides players and teams the opportunity to enhance their skills through the futsal philosophy. All teams will play an 8-game regular season. Games will be played on Sundays. All games are governed by the United States Futsal Federation rules and regulations with local exceptions adopted. Games will be played on the basketball courts. All players will register individually during open registration. Players must purchase DGPD uniform kits at soccer 2000 (224 Ogden Ave) in order to play. Volunteer coaches are needed. Players will be registered individually during the open registration process. Volunteer coaches are needed. Leagues may be combined and/or co-ed based on low enrollment. Players must purchase DGPD uniforms in order to play. Uniforms available for purchase at Soccer 2000, 224 Ogden Ave. A coaches meeting will be scheduled for late July. Information will be emailed. Spring League Begins April 20. To register, fill out the registration form below and email it to leagues@dgparks.org or turn it into the Recreation Center or Lincoln Center. 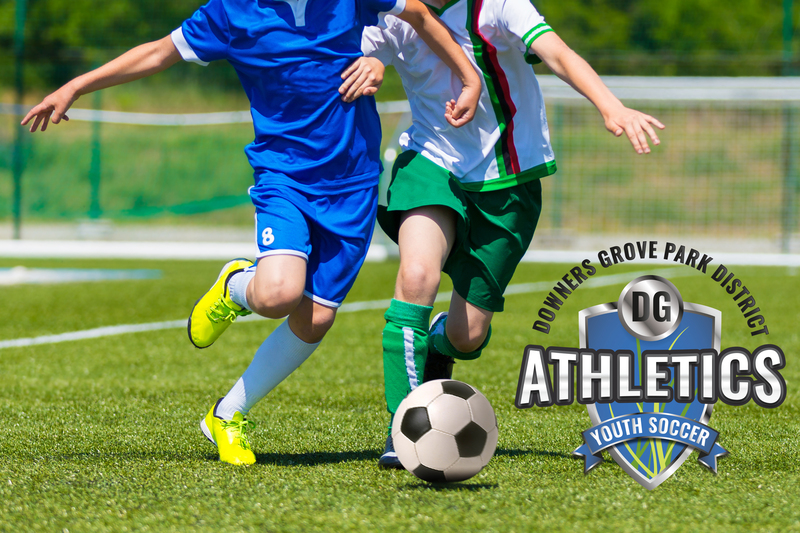 The Downers Grove Park District has introduced the practice grid concept to its players in the youth soccer league. These grids were created to help coaches and players transition to the small sided games mentality. Ultimately, it is our goal to help develop player technique, tactical intelligence and mental speed though this concept. Playing in smaller spaces results in more touches each player receives during play. As the number of touches increases, footwork development increases. Players are forced to think quicker due to less reaction time in a smaller area of space. In order to keep possession of the ball while under pressure, players have think creatively while moving on and off the ball to create the space needed to retain or recover the ball. One practice grid can be split into multiple quadrants where groups of players can train at the same time. See images below. There are several types of situational possession drills to create in a small space; 1v1 or 2v1, 2v2, 3v3 etc. More passing options are created as the number of players increase in the space. The level of difficulty to retain possession also increases with each added player. Overall, the practice grids will enhance technical and tactical skills as players adjust to the speed of play and dimensions of the playing area. This new mentality will ultimately improve their performance during league play on a full field. THANK YOU TO OUR YOUTH ATHLETIC SPONSOR!